Transform an existing electrical outlet into a mini-charging station in the kitchen, office, or school dorm room. Dual USB charging ports with a shared 2.1 amps charge two smartphones. The ON/OFF switch is accessible for a quick power-down or circuit breaker reset. 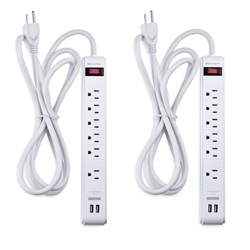 It is wall or surface mountable with screw keyholes on the underside of the surge protector. Dual USB charging ports with a shared 2.1 amps provide with protection from power spikes for your valuable electronic devices. All connected devices are protected with surge suppression up to 300 joules.